Tired of repetitive, pre-scripted fire bombing missions? Trigger switches that are supposed to put out fires that may or may not work? Want the real thing? 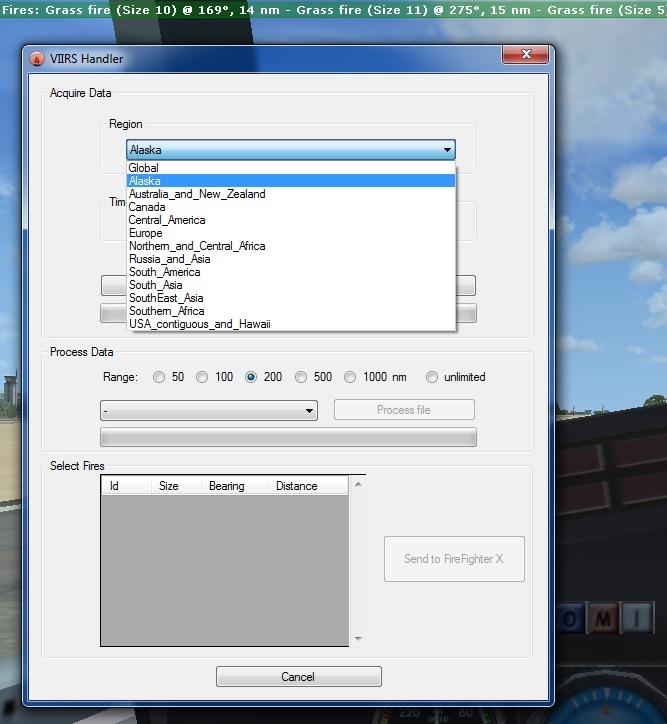 Meet FireFighter X.
FireFighter X - Addon for FSX and P3D . This addon application is not mission-based, but instead it puts you in a completely dynamic environment, where fires live and grow, are aware of weather and precipitation, generate updrafts and general mayhem. And you can test your skills at actually putting them out. FireFighterX does not include any airplane models. All airplanes depicted on this site are freeware and readily obtainable online! Please see the disclaimers on the bottom of every page and the "Aircraft" tab for details. • Option to use FIRMS - MODIS or VIIRS wildfire data download from nasa.gov for the fire depiction (and extinction...). • Spawn fires at random or in any specific place you like. • Watch them grow and multiply themselves - detailed simulation of wildfire behaviour, taking wind and precipitation effects into account. • Jump into your water bomber and do something about it! Detailed simulation of the retardant drop with visual effect - and it accurately extinguishes the fires depending on altitude, distance and retardant effectiveness. • Use any plane in your FS hangar to fight the fires. FireFighter X will detect the payload stations and load up the retardant/water automatically. Just make sure you do not overload your aircraft! • Fight the nasty updrafts over the fires. • Keep your distance – fly too low and suffer the consequences. • Refill your tanks at the airport. • Scoop water from water bodies near you. • Control the effects of weight shift when dropping water or retardant from your airplane. • Use large amounts of retardant as barriers to prevent fires from spreading. • Tweak every aspect of the fire and retardant drop simulation to your liking. • Save or load settings profiles. • Save or load fire situations. FireFighter X includes the optional use of FIRMS "MODIS" or "VIIRS 375m" data. The screenshot above shows a small part of the February 2016 wildfires in Tasmania. The source data is downloaded from the official sources provided by NASA as part of the FIRMS product. The download feature built into FireFighter X makes use of the current 24h datasets, selecting all fire pixels with confidence level "nominal". These pixels are processed by size and brightness, then assembled into wildfires and sent directly to the FireFighter X fire lifecycle. work on FireFighter X continues. This gets better all the time. It has been made compatible and will be released soon. This version is probably mostly for the helicopter crowd. There is a selection of BambiBuckets and Belly Tanks that can be attached to your helicopter - at runtime - at the click of a button - to any aircraft! You can add your own SimObjects to that list too. Important: this feature will only work properly in the Prepar3D versions of FireFighter X (for P3D 2.5, 3.x and 4.x). The reason is, that the mechanics necessary for this type of application are not present in the older versions of SimConnect. Nevertheless, the option to attach a bucket is there in FSX too - but within limitations. The depiction in FSX is not very good, the buckets will stutter. Another video, showing an attached Bambi Bucket in operation. ...and another short video, this time showing the animation of the water fill level inside of the buckets.